Ramps to the Martin Luther King Memorial Bridge are scheduled for improvement work in 2019. The Illinois Department of Transportation (IDOT) plans almost 100 roadway and related public infrastructure projects in the Metro East area over the next five years — including a major renovation of ramps to the Martin Luther King Memorial Bridge in East St. Louis in 2019. The projects are outlined in the department’s $11.05-billion Fiscal Year 2019-2024 Proposed Highway Improvement Program — also known as the Multi-Year Improvement Program (MYP) — which was formally announced May 29 by Gov. Bruce Rauner. Funding for the King Bridge work, as well as for engineering on two other major Metro East highway projects, is specifically included in Illinois’ proposed Fiscal Year 2019 Budget, which was signed by the governor June 4. 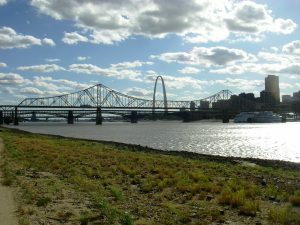 The King Bridge renovations, totaling some $36.2 million, include replacement of a bridge truss as well as major improvements to ramps at the Third Street Exit, over westbound Interstate 55/Interstate 64, and connecting with King Drive, Missouri Avenue, the St. Louis Terminal Railroad and Union Pacific Railroad yards. All the MLK Bridge work to be completed next year, according to IDOT. However, the highest-dollar and most anticipated project on the IDOT five-year agenda is the nearly half-billion-dollar replacement of the I-270 Chain of Rocks bridge across the Mississippi River; linking north St. Louis County with the Granite City area. Missouri and Illinois have agreed to split costs for the bridge replacement with IDOT as the lead agency and the Prairie State’s share of the construction expenses placed at $215,000 over the next five years. The project will also entail another $9.8 million in engineering, land acquisition, and utility adjustments costs on the Illinois side of the river. The state budget allots $1 million for phase 1 engineering on the Interstate 270 bridge replacement in 2019. In Washington Park, IDOT plans replacement of the I-64 underpass beneath Illinois Route 111, to provide greater clearance. Entrance and exit ramps are to be repaired. The IDOT plan allots $2 million to get preliminary engineering studies underway in 2019. On U.S. 67, in Jersey County, construction of the long-planned Delhi Bypass — a new 3.2 section of four-lane expressway costing $23 million — is tentatively set for the 2020-24 timeframe. In addition, land acquisition and utility adjustments, costing $1.4 million, are slated along the highway from Jerseyville to the Madison County line, in anticipation of the future expansion of U.S. 67 in that area. — The $1.7 million rehabilitation of the New Poag Road bridge over abandoned railroad tracks west of Ill. 157 in Madison County. Meanwhile, IDOT plans a pair of projects in the Polar Street Bridge’s Tri Level Interchange, totaling some $51.4 million over the period 2020-24. In the eastbound lanes of I-55/I-64, within the Poplar Street distributor/collector system, IDOT plans bridge repair, new bridge deck, deck overlay, and joint repair at a cost of $33 million. A second project involves resurfacing over 2.7 miles of roadway and additional bridge rehabilitation at a cost of $18.4 million. Several other stretches of regional Metro East traffic corridors are also targeted by IDOT for extensive pavement and bridge maintenance or rehabilitation over the 2020-24 period. The department plans a $96.1 million program of highway resurfacing and bridge renovations along a 17.3 mile stretch of Interstate 255/U.S. 50, from near Illinois Route 157 to Collinsville Road. Along Interstate 70/U.S. 40, from the Madison County line to just west of Sugar Loaf Road in Bond County, IDOT plans to resurface 7.8 miles of highway, as well as overhaul bridges, at a total cost of $28.4. Resurfacing and new shoulders are planned along a 9.8 miles of Ill. 4, from I-55 to Illinois Route 143 near Edwardsville, at a cost of $16 million. The IDOT plan also calls for $4,534,000 in unspecified Congestion Mitigation and Air Quality (CMAQ) projects in the district during 2019 and another $12,989,000 over 2020-24. Fixing America’s Surface Transportation (FAST) Act funding for Metro East transportation projects, announced last week, will be detailed in a future issue of the Chronicle. For a complete list of Metro East highway projects planned by IDOT over the next five year, see https://tinyurl.com/IllMYP.